At a special meeting of the trustees of the Amateur Field Trial Clubs of America held in the Netherlands Plaza Hotel in Cincinnati, Ohio on Saturday, May 19, it was voted to initiate a National Amateur Shooting Dog Championship under the auspices of the Amateur Field Trial Clubs of America. The news will be hailed with enthusiasm by bird dog owners throughout the land. The stake, as the name implies, will empower bestowal of the title of “National Amateur Shooting Dog Champion”. 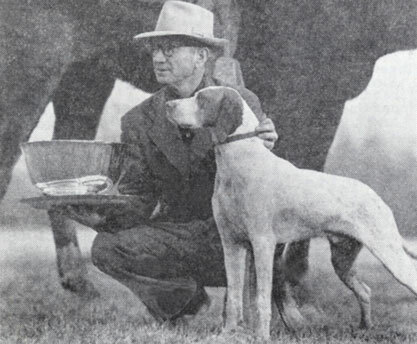 The demand for such a feature and urgings that the Amateur Association assume sponsorship of this type of stake prompted Raymond Hoagland of Cartersville, Georgia, AFTCA president, to call the special meeting of the directors, and the vote was unanimous that the Association proceed with the details for the establishment and management of the National Amateur Shooting Dog Championship. Several venues were considered for the inaugural running of this event but the grounds at Hernando, Mississippi (about 20 miles from Memphis, Tennessee) were selected because the courses afforded precisely the right conditions — ample game, plenty of cover, opportunities for a dog to adjust his running to the character of the terrain, providing an adequate test of handling response plus a chance to appraise a dog’s intelligence and experience in selection of objectives and manner of searching. 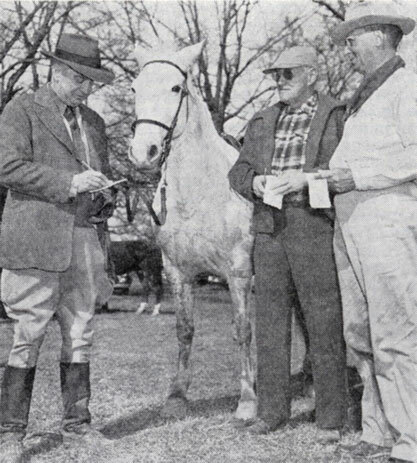 The judges for the inaugural running, Hugh E. Buckingham of Memphis, TN, Frank C. Ash of Fulton, NY and Boyce A. Williams of Tampa, FL accepted the dictum of subservience to the gun and applied sensible standards to the performances of the dogs. Judge Buckingham phrased it succinctly when he said, “We don’t want a dog you have to shout at and ride for; a shooting dog is a dog for pleasure and not to work you but to work for you.” The trio of sportsmen in the judicial saddle, with a wealth of practical experience in the gunning field, know what a real shooting dog is; they have shot upland game in all parts of the country and elsewhere on the continent, consequently when any one of them places his seal on a shooting dog, the excellence of the individual is universally acknowledged. Runner-Up in the first National Amateur Shooting Dog Championship, Texas Village Lady. 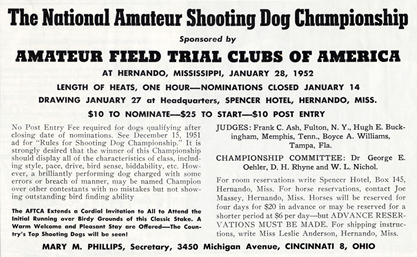 National Amateur Shooting Dog Championship, Hernando, MS, January 28, 1952. 44 Starters — 31 pointers and 13 English setters. 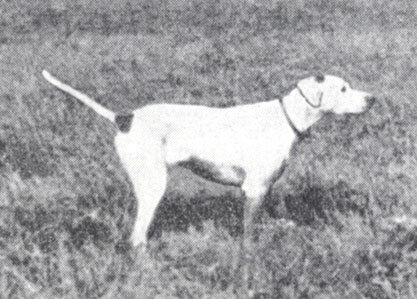 Spit Ball, owned by M. B. Wallace and handled by P. Brooks Holt, was at the top of his form and proved an ace shooting dog in his hour race on Thursday morning. On his breakaway cast, the pointer chalked up his first bevy, displaying faultless manners to wing and shot. He was a bit reluctant to leave this place, but he scored again quite quickly, though in this instance feeding birds were not raised immediately to his point; however in close proximity Spit Ball pointed another bevy and his handler put up the birds from the previous point as he walked over to raise the second bevy. About midway in the hour, the budding champion pointed on a slope and had the forth bevy credited to him, a nicely executed piece of work. Texas Village Lady, owned and handled by Perry E. Gray, made her appearance in the hour heat on Tuesday morning when conditions were rugged. She laid a beautiful pattern down and scored a meritorious bevy find, though later charged with an unproductive in a cornfield. Lady was put down in a second series with Ponder and showed on marked birds as well as climaxing her effort with an excellent bevy find, handled flawlessly. After Texas Village Lady and Ponder had engaged in a second series Thursday afternoon, Spit Ball was called back to work marked birds from a bevy that Lady had found. He quickly found and pointed a single in high grass, handling it satisfactorily, whereupon the judges felt his well-rounded performance merited the crown for him and terminated the stake. He gained for his owner, Mr. Wallace, the initial leg on the prized Mary M. Phillips Trophy, presented by Raymond Hoagland. Texas Village Lady gained for her owner a leg on the W. H. McNaughton Trophy for her Runner-Up win. Part of the Gallery of the inaugural National Amateur Shooting Dog Championship. Event at Hernando designed to popular feature. Champ and his handler. Spit Ball shown with Brooks Holt who holds the Championship Trophy. 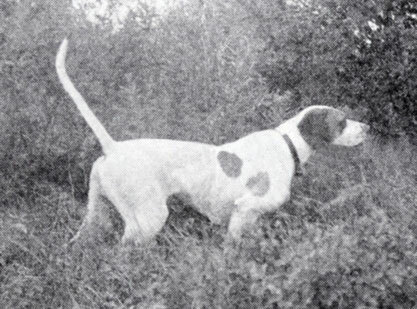 Much thanks to Steve Standley for his research and locating the 1951 and 1952 issues of the American Field that held the above information on the National Amateur Shooting Dog Championship.